So I bought one on eBay. At first I was playing it a lot myself, because the small size and "V" shape made it ideal for perching in my lap while I was doing things like reading email or playing board games -- when my hands were busy with something else the neck would rest on one leg and the inside of the V sit against the other, and then when I was between messages or turns it was right there for me to play. But after a while I realized that getting used to the short scale was kind of messing up my feel for standard fretboards, so I stopped playing it so much. New VeeWees are sold in "Rave Rig" (the red VeeWee shown above) and "Zakk Pakk" (the black-and-white-bullseye design shown below) packages which include a battery-powered mini-amp, strap, gig bag, and cord in addition to the VeeWee, but as the eBay auction I got mine in was for the VeeWee guitar only, I don't know anything about the quality of the amp and gig bag. VeeWees used to be available in black ("ebony") in addition to the red model shown above, but as of February 2010 Epiphone had discontinued the black model and was only making them in red. However, in fall 2010 Epiphone released a "Zakk Pakk" VeeWee featuring Zakk Wylde's signature bullseye graphic in a very striking black and white as shown here. (For even more colors, check out the section below on the Maestro Mini-V.) Although the V shape has been billed as "futuristic" ever since the first Flying V/Vee was made in 1958, to me this tiny version looks like some kind of pictograph of a child, with the points of the V being two legs running along. And of course it has a head and a neck, you hold it in your arms, it's little, it looks bright and energetic, you get the picture! Gibson/Epiphone's Flying-Vee Wee Rave Rig page is pretty much just an illustrated blurb. Epiphone's news release on the new "Zakk Pakk" bullseye-design VeeWee is much more extensive, with very detailed specifications for both the guitar and amp. The Unofficial Epiphone Guitars Wiki's Flying Vee-Wee section and Flying Vee-Wee Zakk Pakk section are pretty much just lists of specifications along with photos. Although Musician's Friend no longer carries the red VeeWee (only the bullseye-patterned "Zakk Pakk" ), they still have a red VeeWee page including a large number of reviews . 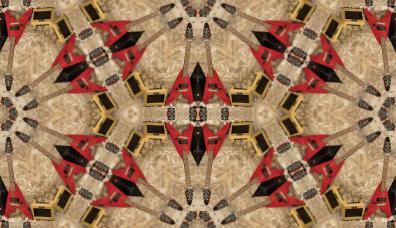 Harmony Central's extensive database of guitar user reviews includes ten VeeWee reviews. In fact, one of the reviews details how the reviewer modified the VeeWee to be a lap-steel guitar and absolutely loves it. Music Gear Review has a single VeeWee review -- the reviewer got one on sale for $59 to be a "Great functional non-toy guitar to let my very young kid destroy learning the basics" but had not really done much with it yet at the time the review was written. ultimateGuitar.com has a VeeWee review with many comments. Gibson's online forums have a discussion on tuning the VeeWee. Finnish teen guitarist Otu's guitar collection includes a VeeWee. Here's a video of young Anthony rocking out with his VeeWee at his dad's wedding. Here's a video of a very young VeeWee owner happily strumming along with a favorite song. Here's a video of 13 Stars's Matt Thompson playing a "Zakk Pakk" VeeWee. Actually quite a few people have been uploading videos of themselves playing "Zakk Pakk" VeeWees -- just do a YouTube search for zakk veewee and you'll get a list of videos to choose from. Here's a picture of young Declan playing his VeeWee. Here are some pictures of Garry Parker's kids having some VeeWee fun. Here you can see Superman Jack playing his new VeeWee at his second birthday party. And here you can see an even younger VeeWee player. p.s. If you look at the picture at the top of my Fender Venus page, you can see the VeeWee hanging on the wall (courtesy of a "String Swing ") in the background, though it's since moved to an adjacent wall (actually, you can see it on the current wall in this picture) as things have gotten rearranged. Gibson/Epiphone has now introduced a second short-scale Flying V electric guitar model called the "Maestro Mini-V", which looks pretty much identical to the VeeWee other than offering the additional color choices of blue, yellow, purple, pink, and even a "pink flowers" pattern as shown here. Take a look at Gibson/Epiphone's product page for the Maestro Mini-V. Here you can see a video of 13-year-old Randy rocking out on a red Maestro Mini-V. Check out Marco A. Tejada's video review of his modified yellow Maestro Mini-V -- scroll down to the comments section to read his description of the mods/upgrades he made to the guitar. The only online retailer I've found selling the Maestro Mini-V so far is Amazon.com , which is only offering them in red , blue , and yellow . Though unfortunately as of March 2011 Amazon is now listing all three colors as "Currently unavailable" -- hopefully they will return at some point! Here's a short video of a Daisy Rock representative talking about the Star series at the 2006 National Association of Music Merchants (NAMM) trade show. See also Harmony Central's page of Daisy Rock Debutante Star user reviews.